Toys As Tools Educational Toy Reviews: Review: Bathroom Independence is Possible! Do your kids NOT know how much shampoo/body wash to use? I am so tired of my kids using up the shampoo like it was water! I have drawn diagrams. I have yelled at/spoken kindly to them. I have tried different squeeze bottles and pumps but to no avail. They are impulsive and often times the shampoo bottle becomes a toy. Before you know it, all the shampoo is gone. Still at ages 6 and 9, I don't want to be in the bathroom anymore. They have to be on their own! And NOW..... I have this mesh soap-saving sleevy scrungee thing (a.k.a. soap saver) and it saves my sanity too! It's so easy for them to use! I don't have to micromanage in the bathroom either! I don't know about you but by bath-time, I am SO TIRED. Lathers up in seconds. Leave the soap in there. They'll learn how little soap is needed to make lather. 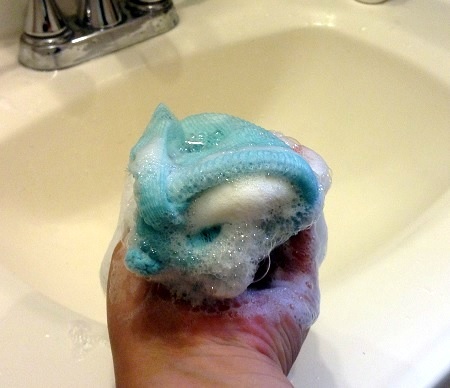 The soap saver is strong too. I would guess that it lasts longer than mesh sponges in every home but in out home, it definitely lasts longer than an average mesh sponge. (My kids can be a little destructive- in a semi-innocent way) Anyway, there is less frustration, more independence, and more cleanliness now. Most of all... less spending money on shampoos and body wash! YEAH! Here are some suggestions. Like I said in the video, I bought mine from Bed, Bath, and Beyond and the latter link below looks exactly like mine. The first link looks quite similar too. Sorry, there's no link for you from BBB. I think it is just too cheap to bother listing online. It was $2 there. However, if you are shopping in the Jungle and would like to support Toys are Tools (at no cost to you), please put it in your shopping cart before logging out! 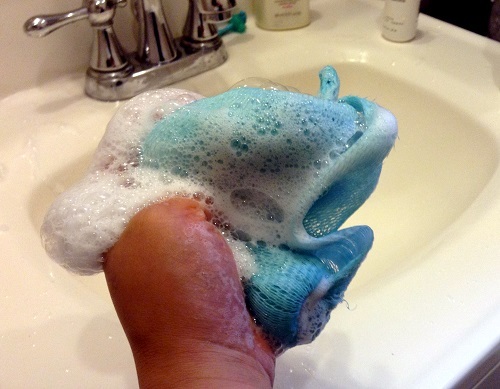 Soap Bar Ideas: (Our family has been using Dove Unscented since the diaper days- on hair too- We have eczema with both kids and our pediatric dermatologist suggested this to us when #1 was just 4 months old.) I don't think either soaps below qualify as shampoo but I don't care. They are still young and so I gather I won't be changing to liquid until they hit puberty. This Burt's Bee product had the right idea but at the time of publication, one bar was $49.99. I decided not to buy it. Disclosure: Toys are Tools was not compensated by the manufacturer for the publication of this review. Toys are Tools purchased the product in the video and pictures and will likely do it again very soon as it is good to replace those once in a while... you know.... germs.... Reviews are never promised.